Any other components found to be faulty will be replaced. All internal components are adjusted and set as per manufacturer's specification. 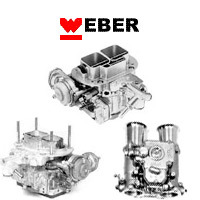 Carburetters are given a final inspection and guaranteed for 6 months. and we will give you £40* off the list price!!! **Pls note that due to the nature of this product, returns are accepted but we will have to charge a re-stocking charge as there are several days of labour go into rebuilding these units. These are only built to order so please make sure by talking to us first this is the correct item for your vehicle.